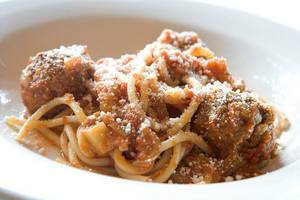 Spaghetti and meatballs at Poggio. Photo from Facebook. ~POGGIO~ is offering an Italian-American-inspired Tuesday night supper special throughout March. The suppers are a more casual, family-style affair with four to six small antipasti to start, followed by crowd-pleasing spaghetti and meatballs. In the antipasti department, look for rotating selections like marinated grilled asparagus and calamari and octopus salad. The finish is also old-school: ricotta and chocolate cannoli. In April, look out for the same format, with cioppino in place of meatballs. The supper is offered every Tuesday from 5:30pm-10pm and costs $30 for adults and $15 for kids. If you love bacon and beer (and really, who doesn’t? ), make sure to check out the ~OAKLAND BACON AND BEER FESTIVAL~ on Sunday March 9th from 2:30pm-5pm. The event is a fundraiser for Oakland Grown, and lots of restaurants and breweries are participating. Look for bacony vittles from folks like Fist of Flour Pizza, Flora, Grand Lake Kitchen, Kainbigan, and the Whole Beast, along with beer from Magnolia, Almanac, and Calicraft. Tickets are $40 per person and include all the bacon and beer samples you can handle. The Market Building at Jack London Square, 55 Harrison St. at Embarcadero West, Oakland.